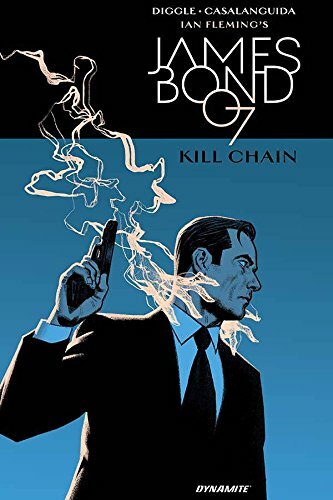 The collected hardcover edition of Dynamite's James Bond KILL CHAIN by Andy Diggle and artist Luca Casalanguida is out now. When a counterespionage operation in Rotterdam goes catastrophically wrong, James Bond finds himself in the crosshairs of a plot to smash NATO. Someone is assassinating allied agents, and 007 is the next target in the kill chain. Having kept the peace for decades, the old alliance is collapsing, pitting MI6 against its former ally - the CIA! Dynamite Entertainment proudly presents the return of writer Andy Diggle and artist Luca Casalanguida as they plot the return of James Bond's oldest and deadliest foe: SMERSH! Purchase the collected KILL CHAIN at Amazon.com (U.S.) and Amazon.co.uk (UK). 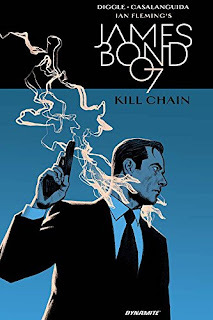 The next collected edition will be James Bond: Case Files Vol 1. It's available for pre-order at Amazon.com (U.S.) and Amazon.co.uk (UK).